Manchester City left-back Benjamin Mendy hasn’t kicked a ball competitively since 23 September 2017 after rupturing the anterior cruciate ligament in his right knee, but remains hopeful of playing some part before the season ends. Mendy could even return in time for April’s Manchester derby, with Pep Guardiola recently suggesting that the 23-year-old could play 20 or 25 minutes very soon. And subsequently, the 2018 World Cup remains a realistic target for Mendy, who has made it clear that he hopes to play a part in Russia where he’d likely start at left-back if fully fit. From RMC Sport in France on Sunday evening came news that the national team’s medical staff examined Mendy, who is back in training at City, after their Friday night game against Colombia to check on his condition. 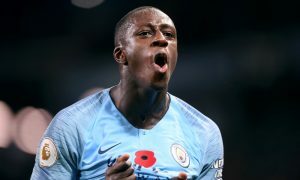 Didier Deschamps is closely monitoring Mendy’s return situation and is hopeful of including the popular Man City star when Les Bleus fly out to Russia this summer.